Figures obtained by the BBC show 33,460 sets of roadworks over-ran during that period in 143 council areas. 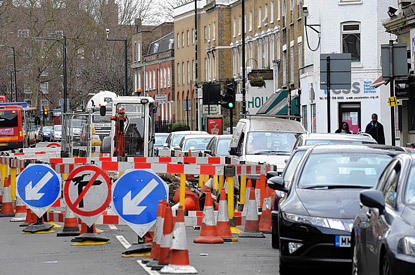 National Grid, at £7.1m, paid out the most in fines, while Essex County Council experienced the highest number of over-running roadworks at 3,165. National Grid said it aimed to complete projects on time. A spokeswoman said it was a third of the way through a 30-year programme to replace metal pipes, which was a one-off project, and it worked closely with local authorities when planning projects. The figures, which were obtained under the Freedom of Information Act, reveal that the other companies to pay out the most in fines were EDF (£4.6m), Thames Water (£3.7m), BT (£2.4m) and Central Networks (£2.2m). Transport for London received the most in charges at £1.6m, followed by London’s Haringey council (£1.5m), Enfield, also in London, (£1.1m) and Hertfordshire County Council (£1m). The figures also show there is a discrepancy of £9m between what councils were invoiced for and how much companies have paid. As well as charges that are in dispute and payments that are outstanding, this figure also includes where charges are reduced on negotiation with the company, or where companies are given a credit note. In April, the Local Government Association claimed that botched roadworks were costing taxpayers in England and Wales £70m a year. That sum, it said, was the bill councils were left with after contractors for utility companies failed to properly repair road surfaces they had dug up. Workers dug two million holes last year and about 360,000 jobs were not properly completed, often leaving roads in a worse state, the LGA said. The utility industry said controls over repairs were being tightened.